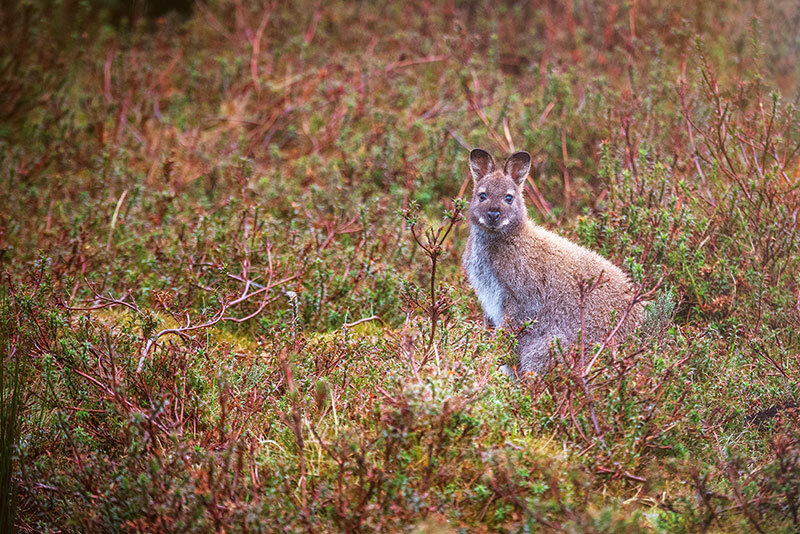 So the three week trip we’d planned to Japan somehow morphed itself into a ten day trip to Tasmania. This in part due to my brother having an engagement party (that turned into a surprise wedding) and my husband (my chief tripod carrier) having to return to work earlier than planned. 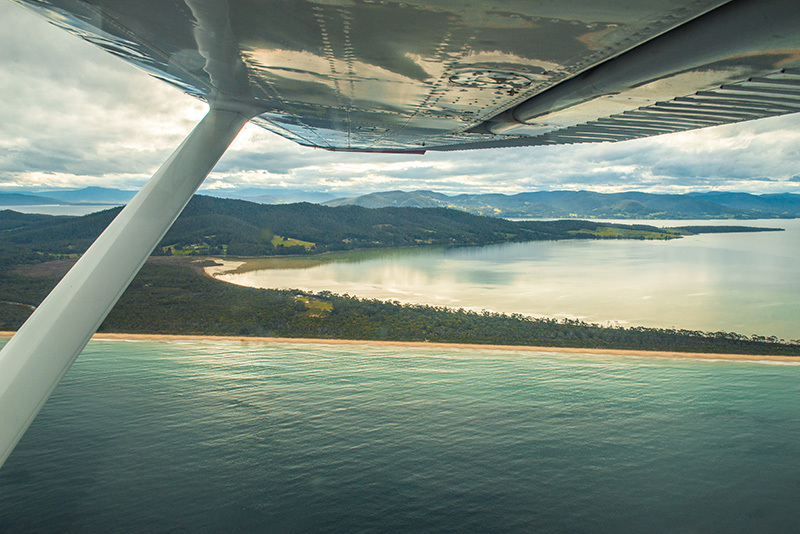 Therefore, instead of boarding an eight hour flight to Tokyo, we took a hop, skip and a jump to Hobart. So, armed with a map printed from my computer the night before and a handwritten list of places to visit from my Dad’s partner who’s a Tassie native, we were ready. Wellllll… after queuing for an hour at the airport to collect our hire car, we were ready! Thankfully we had plenty of things to think and talk about in that queue and with lunch top of the list we began googling the best restaurants in Hobart. We had caught a 5am flight, it was the first day of our holiday and we were ready to spoil ourselves. So we had lunch at pretty fancy shmancy restaurant called The Agrarian Kitchen which is housed in a former psychiatric hospital. Perfect! Actually it was pretty damn amazing. That night we stayed in Hobart at a rather fabulously grand ye olde worldy hotel called Hadley’s Orient Hotel before heading West to Derwent Bridge. 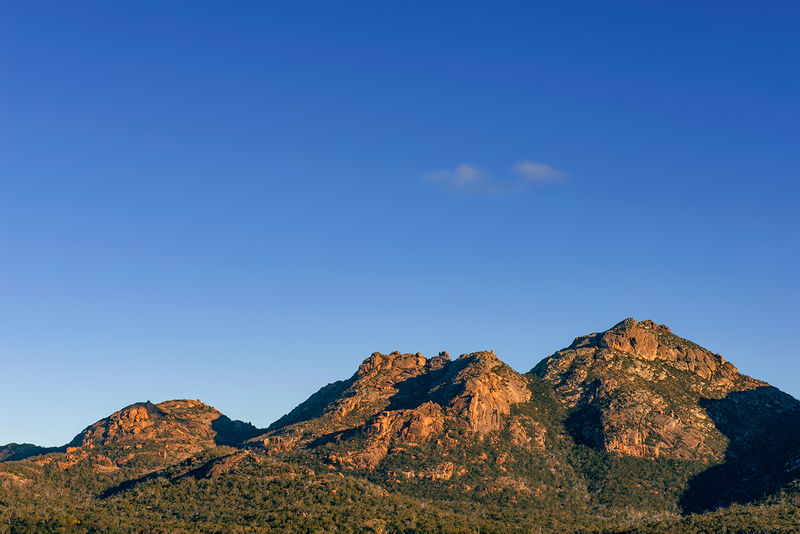 Which brings me to the start of my Top 5 Tassie list. By the way, this list is in order of our travels and I know there’s probably a gazillion places we’ve missed and I’m sorry but they’ll just have to wait for our next trip (definitely happening)! 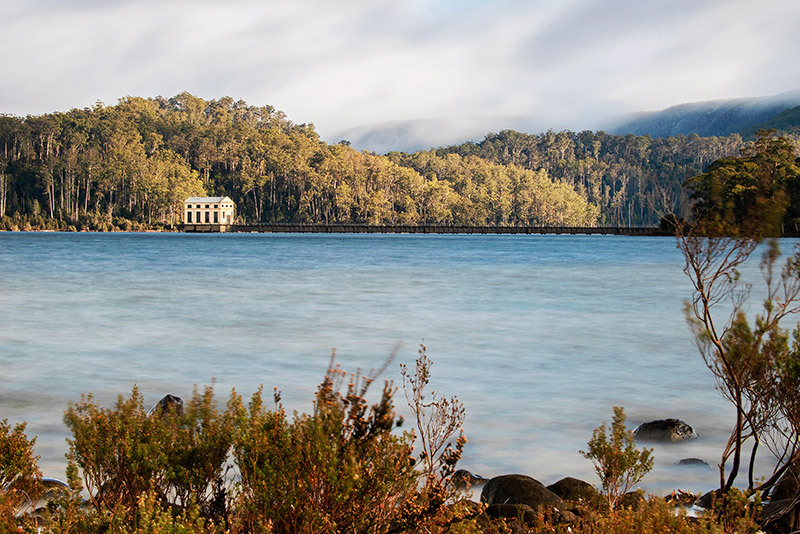 The shot I was after was an aerial view of Pumphouse Point on Lake St Clair but on arrival we discovered that pretty much the entire area is National Park or Reserve and we couldn’t use our drone so I had to scout for a different angle. We returned at sunrise the next morning with tripod, filters and full of optimism (if little else) to ward off the cold. Then just as we were leaving, it started snowing. In November. In Australia! I didn’t get the shot I wanted but it didn’t matter, snow is exciting and I was like a (very cold) kid in a candy shop freezer. FYI – If you’re in the area you have got to go to The Wall. It’s amazing. Trust me. 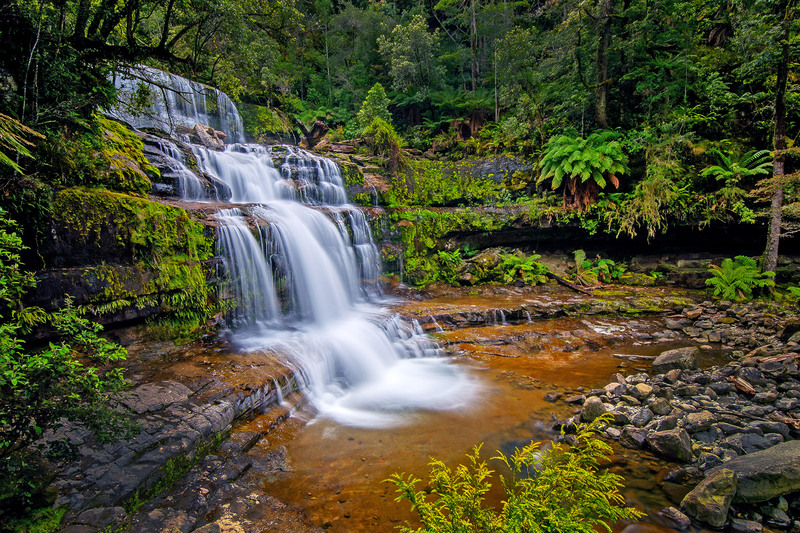 For such a big tourist drawcard, Tasmanian Parks and Wildlife have done an amazing job at protecting this area and keeping it a wild, untamed, glorious piece of Australia. The two days we were in the Park, we crossed paths with only two other people who were out hoping to spot Tasmanian Devils. Admittedly we were not in peak season and most tourists/hikers were arriving and leaving on the shuttle bus. Plus I’m always chasing sunrise and sunset for the best light so we were arriving at 5am and leaving around 9am or arriving after 7pm. 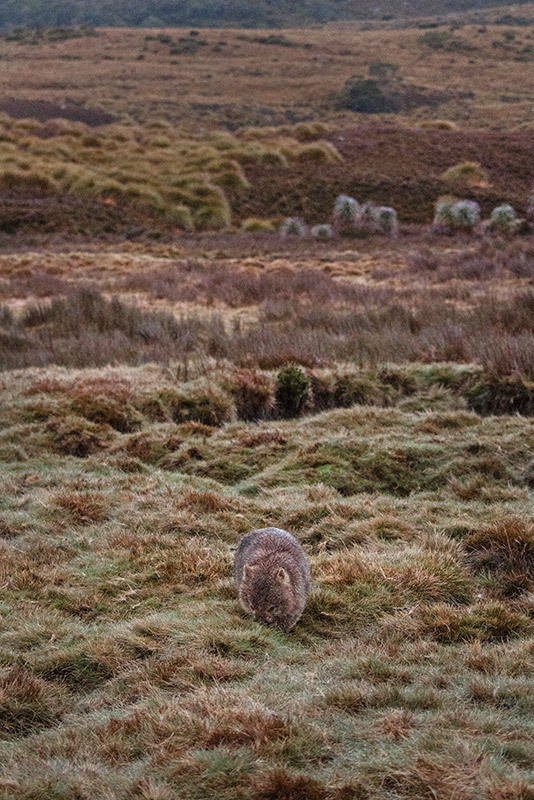 The wildlife that emerge around this time is prolific and even as an Aussie born and bred, I let out an excited screech the first time I spotted a wombat in the wild. My husband was driving at the time and was a little less impressed with my high pitched vocals. 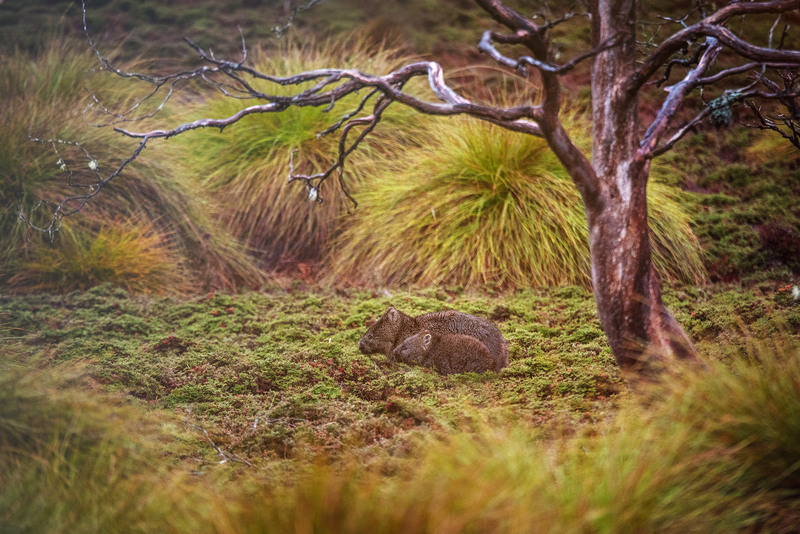 A wombat and her young emerge for a feed just as the sun sets, Cradle Mountain National Park. 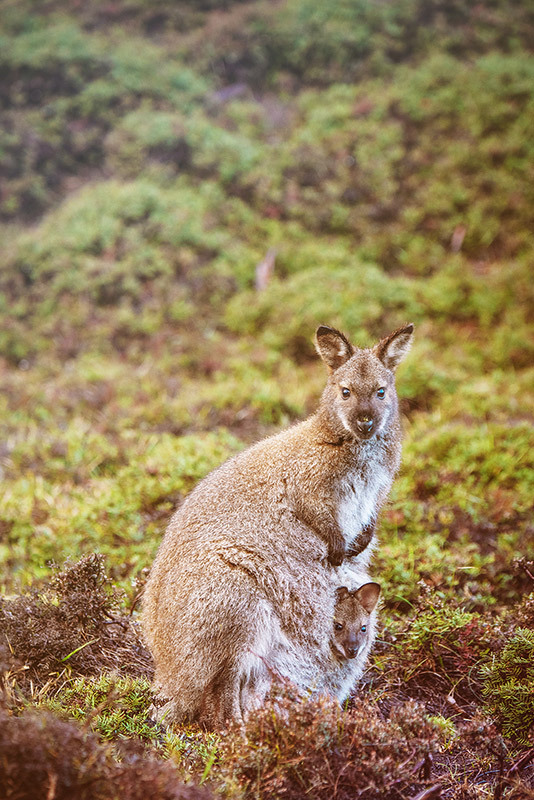 A curious joey watches the world go by from the safety and warmth of its mother’s pouch. 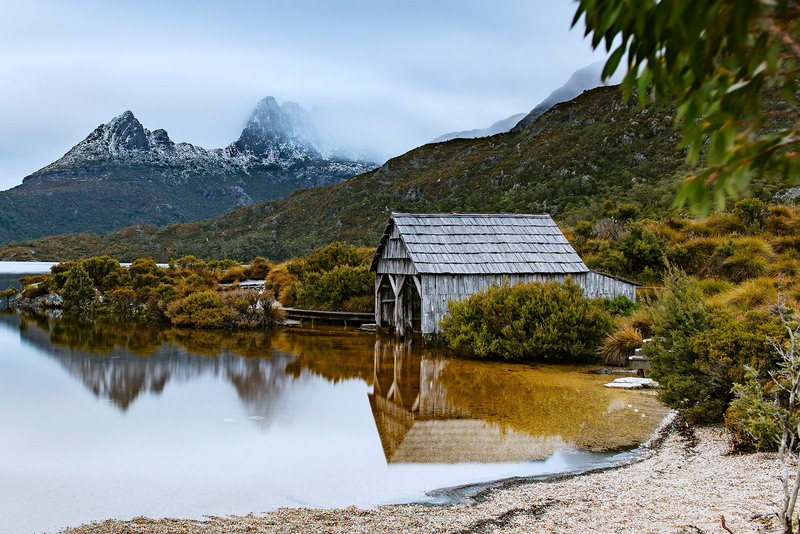 Cradle mountain breaks through the cloud behind an old boatshed built by a ranger in 1924. The glass-like waters of Dove Lake provide a beautiful reflection in the cold, early morning light. 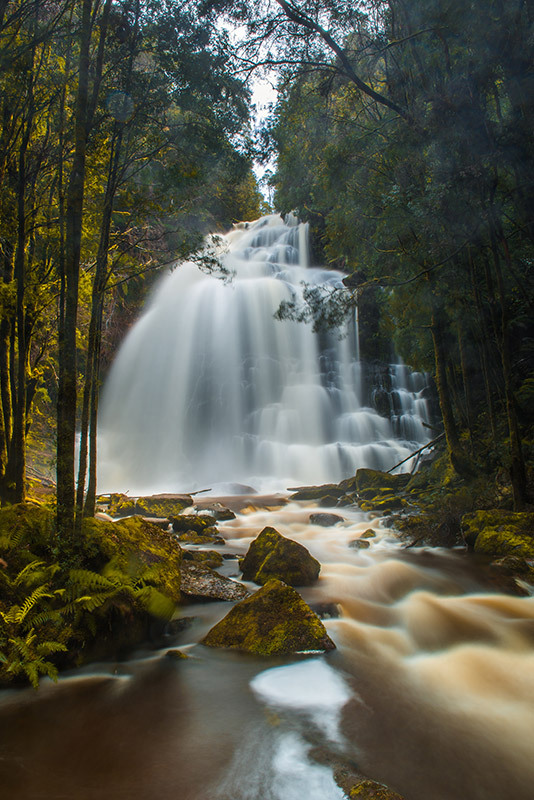 We visited quite a few waterfalls on our Tassie travels but this one was my favourite to photograph and the most confusing to get to. Both Google maps and the road signs could do with a little updating. If you want to do the shorter walk, take the road that heads uphill (you’ll understand when you get there). 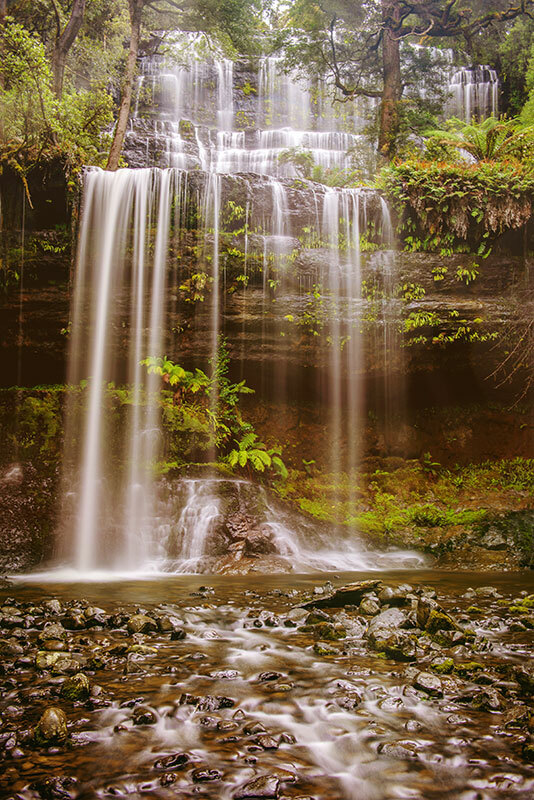 We also stopped at Russell, Horseshoe and Nelson Falls which are all beautiful. There’s some photos of them too so you can make your own mind up. Or do what we did and visit them all. We had hit the East Coast and I was excited! 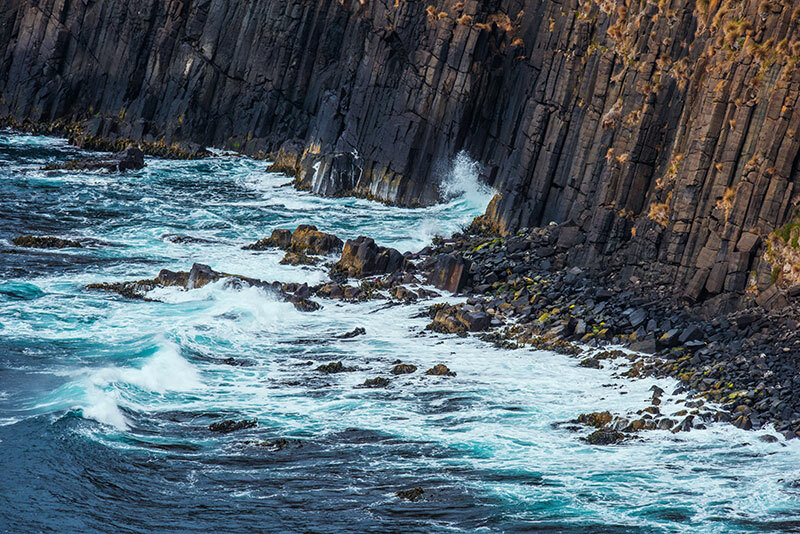 I had all these great sunrise photos pictured in my head with red lichen covered rocks glowing as the morning’s sun rays bounced off them. As per every sunrise we had experienced on the trip so far, we were greeted with thick grey cloud and a lacklustre (at best) sunrise. By this point I have to admit, the constant 4am wake ups, a lack of coffee and no spectacular sunrise shots to show for it, may have made me a little grumpy. 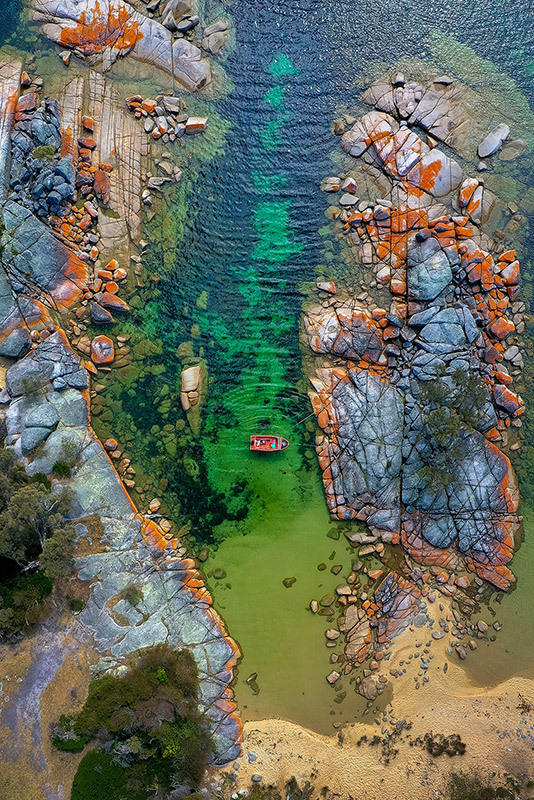 However, after a hot shower, a blast of coffee and a bite of toast, the clouds cleared and we were back out on the rocks, this time armed with our drone. Finally a place we could let it fly! 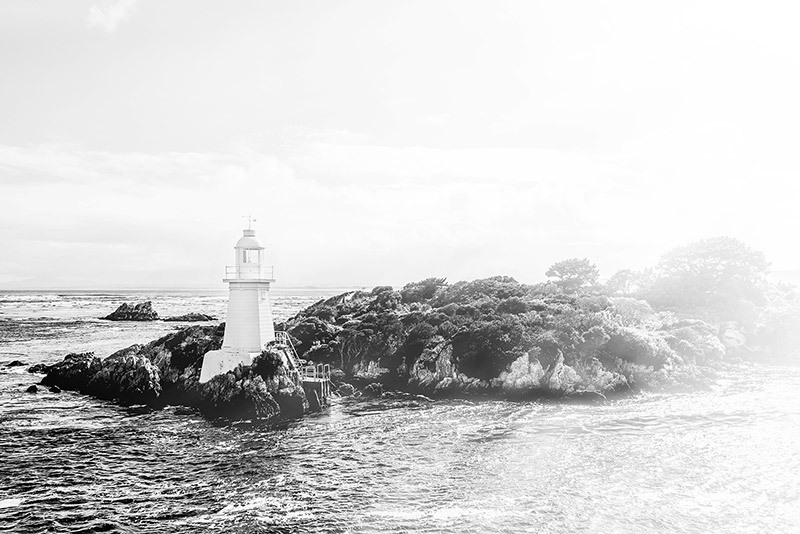 Fun fact for the day: Bay of Fires was actually called that because of the Aboriginal fires that lined the shores when Captain Tobias Furneaux sailed past in 1773. Not because of the red lichen on the rocks like I had thought! 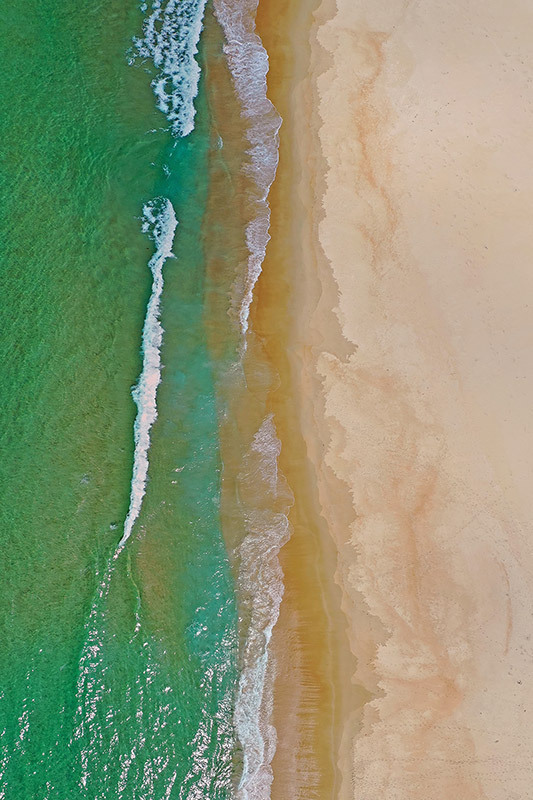 Thousands of tiny bird prints pattern the sand as turquoise waves lap the beach. 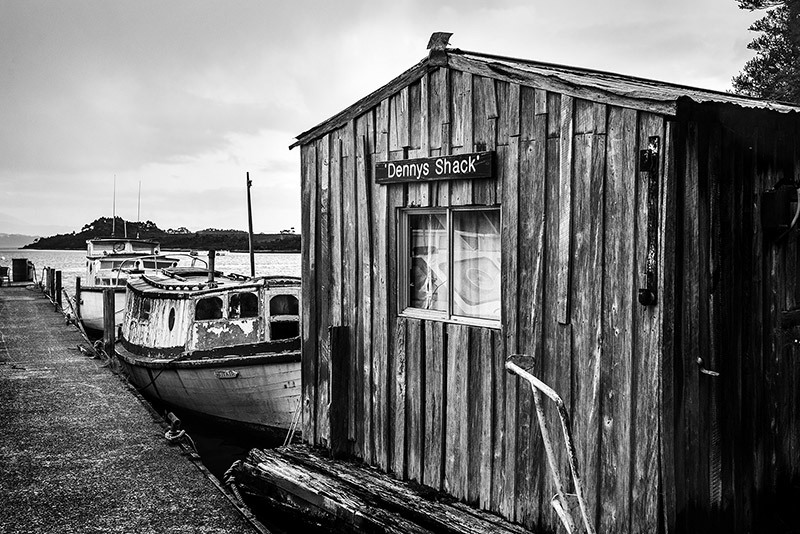 Photo taken on the East Coast somewhere between St Helen’s and Scamander. 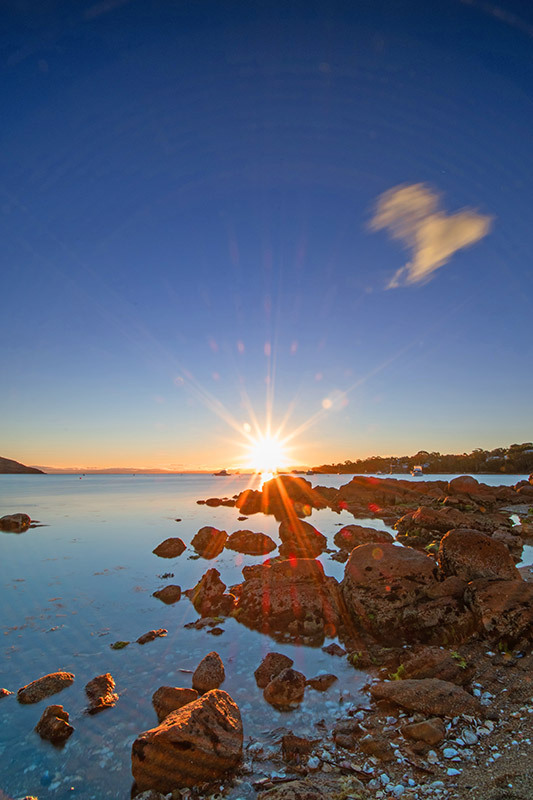 Arriving in Coles Bay in the late afternoon, we took ourselves down to the beach to scout locations and were treated to a brilliant sunset. As the sun lowered, more and more people arrived on the beach with their chairs and blankets quietly soaking up the last of the day’s rays. 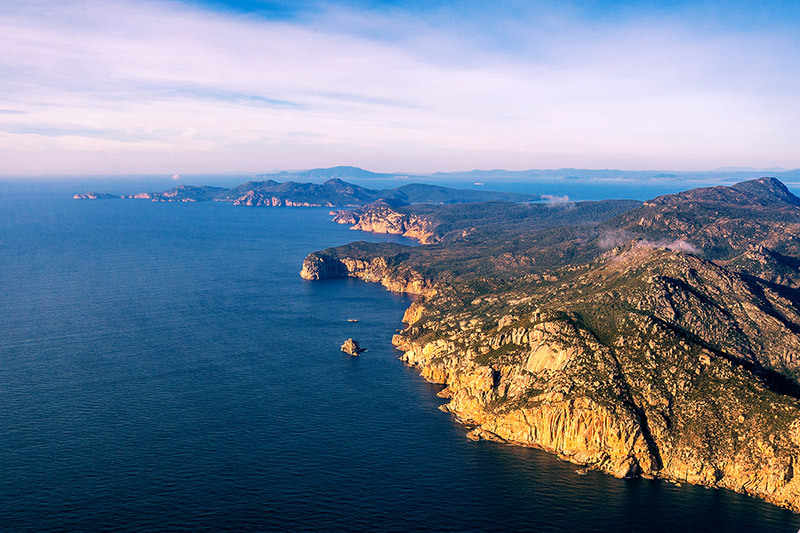 As it was the last stop on our trip before heading back to Hobart for our flight home to Brisbane, I suggested to my husband we could do an early morning walk up to Wineglass Bay Lookout for sunrise, or even better Mt Amos. 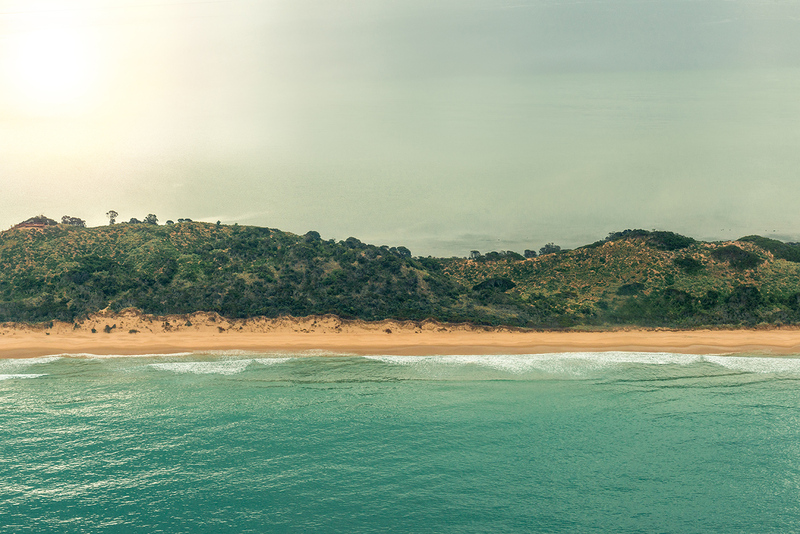 Alternatively, we could do an early morning scenic flight. 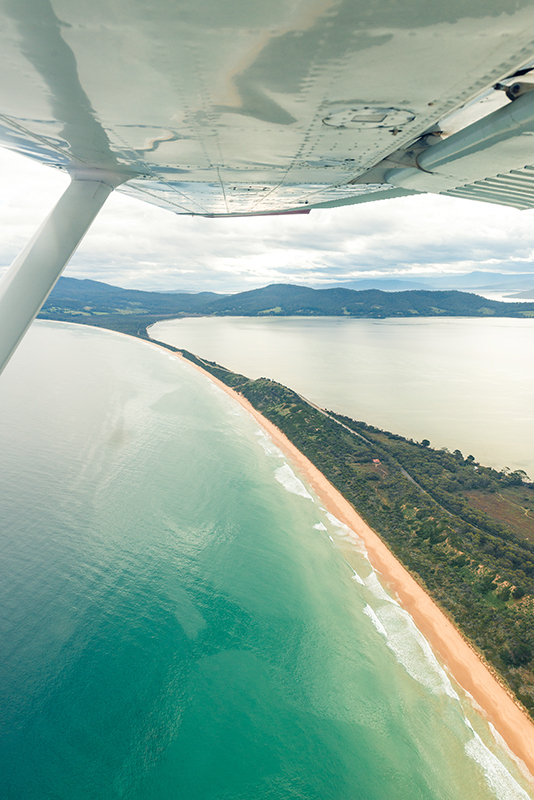 After a week of disappointing sunrises, he didn’t hesitate and the scenic flight was sensational. Mother Nature had decided to finally reward us for all our past sunrise dedication and the weather was the best we’d had so far. The sun was brilliant, the water like glass and not a single puff of wind. 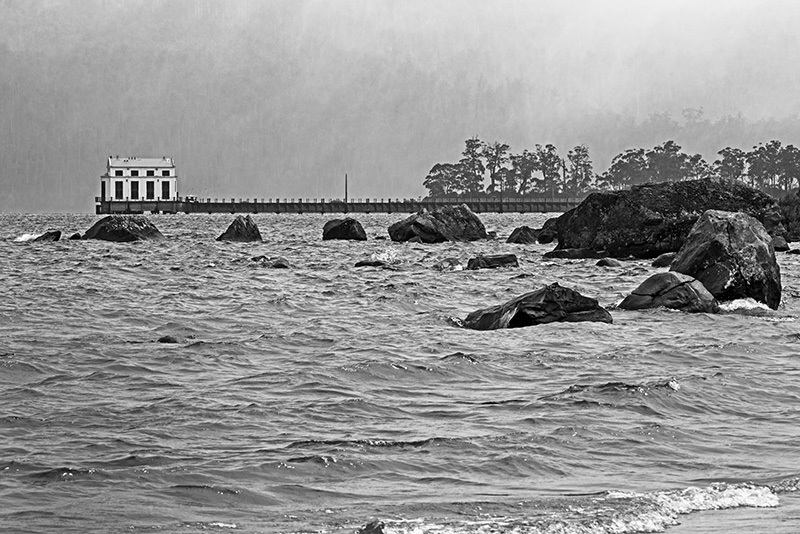 Of course in typical fashion for Tasmanian weather, all that changed a few hours later when the clouds rolled in and the wind started blowing a gale but by that stage we were back in front of our log fire. It was the end of a spectacular day and as the sun lowered, the granite peaks of The Hazards soaked up the last of the day’s rays. 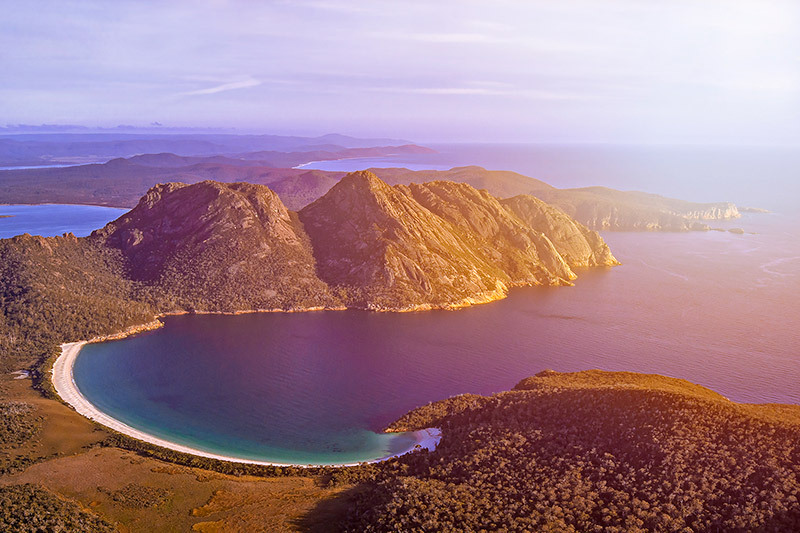 The early morning sun lights up Wineglass Bay and The Hazards in spectacular fashion, bathing the rugged coastline in warmth. 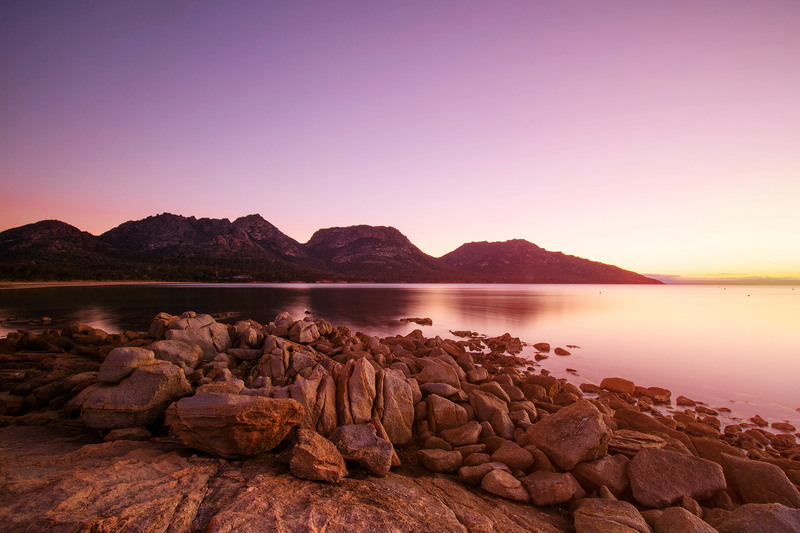 Wild and largely untouched, schouten Island and Freychinet’s East Coast is bathed in Golden Light from the early morning sun. It’s such a clear day that even Mount Wellington can be made out in the distance. 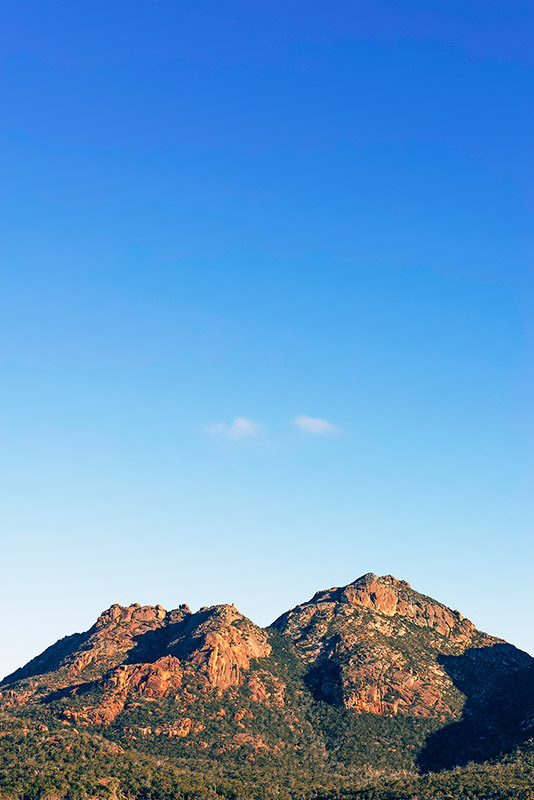 The pink granite peaks of The Hazards rise up dramatically from the horizon, glowing red in the afternoon sun. Well that was my Top 5 but here’s two more bonus places I would like to mention. 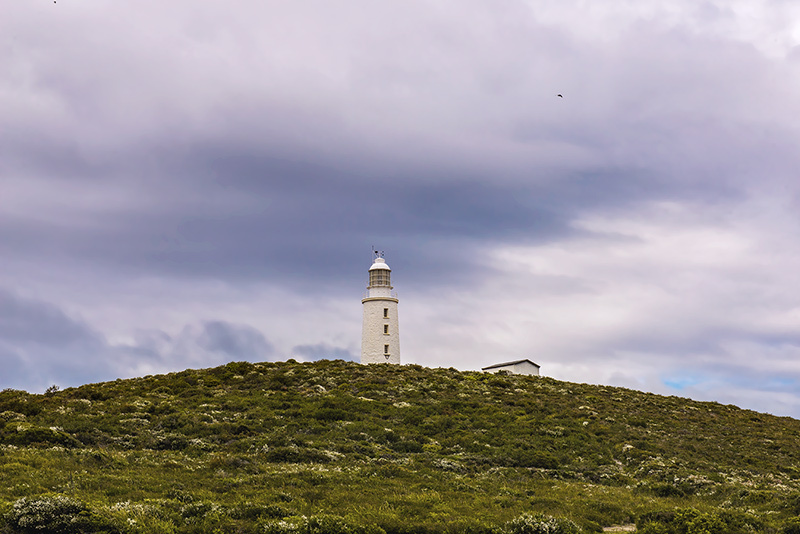 We took the car over on the early morning ferry and made our way straight down to the lighthouse because we wanted to avoid the tour busses that we’d been told would arrive later. It’s totally worth the drive and when we got there, we could pay to go up to the top, which we did so I could get a better view. 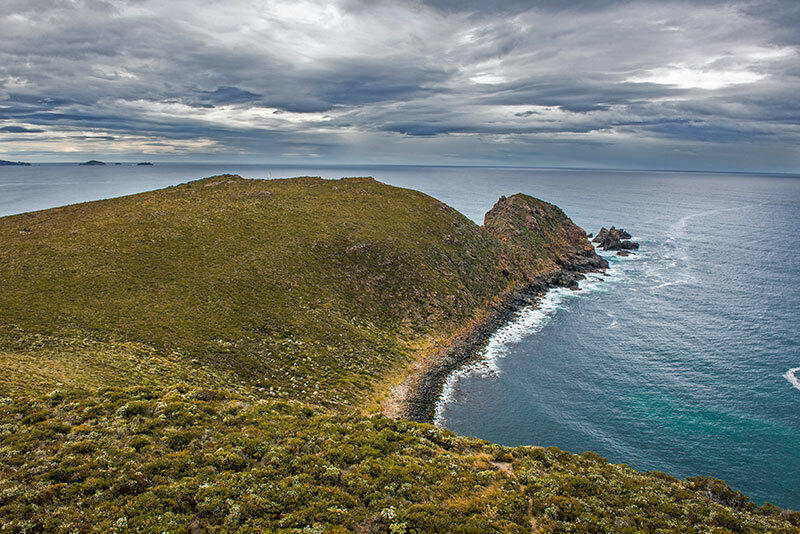 But the real highlight of this was the Bruny Island local that came up with us and told us all about the lighthouse, the region and the history – he was a bit of a character too. 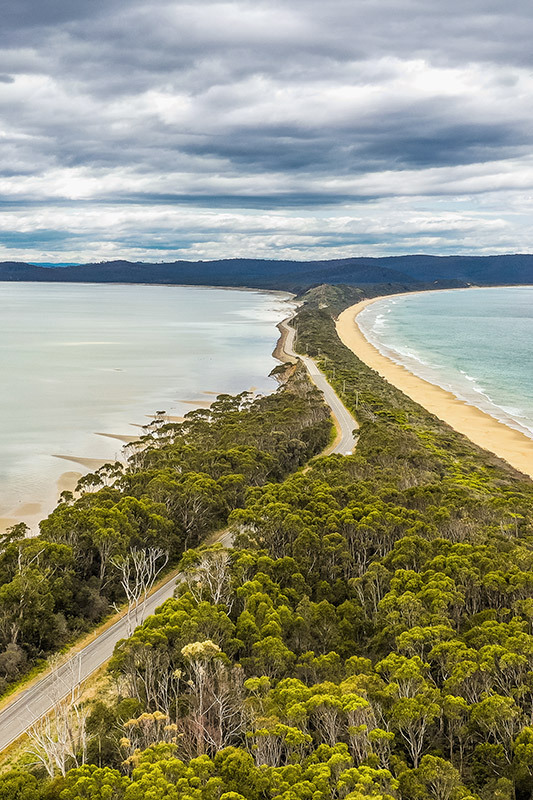 Of course, Bruny Island is worth a visit just for the local cheese, craft beer, Tassie wine, handmade chocolate and freshly shucked oysters too. Literally ALL of my favourite things. Luckily we had the car, otherwise I would have had to be rolled back onto the Ferry. 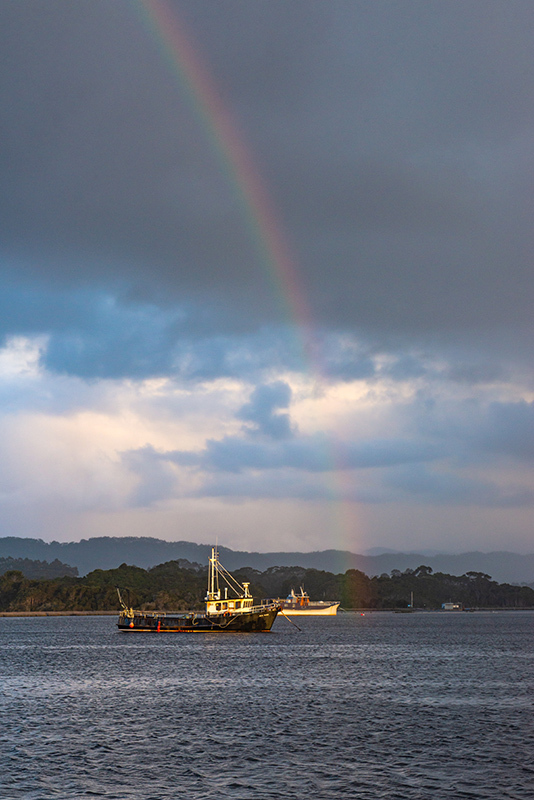 If you find yourself on the West Coast passing through the old fishing town of Strahan with time to spare, it’s worth doing the boat trip with Gordon River Cruises. The weather was against us so I wasn’t able to capture those beautifully mirrored reflections in the Gordon River but the cruise out through Hell’s Gate made the trip worthwhile. As did visiting Sarah Island and learning about the story and history behind one of Australia’s worst convict penal settlements. 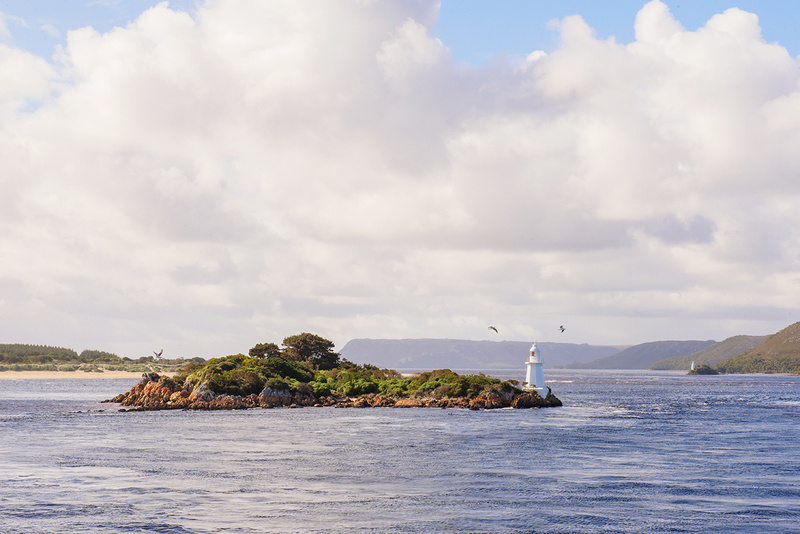 The lighthouse on Bonnet Island, also marking the entrance through Hell’s Gate into Macquarie Harbour is also home to a thriving colony of little penguins. 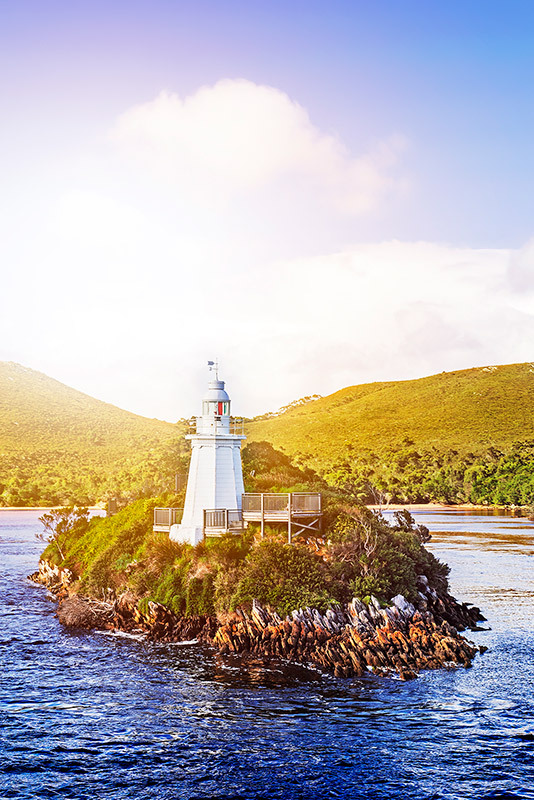 The lighthouse on Entrance Island marking the notorious passage through Hell’s Gate and into Macquarie Harbour, Strahan. 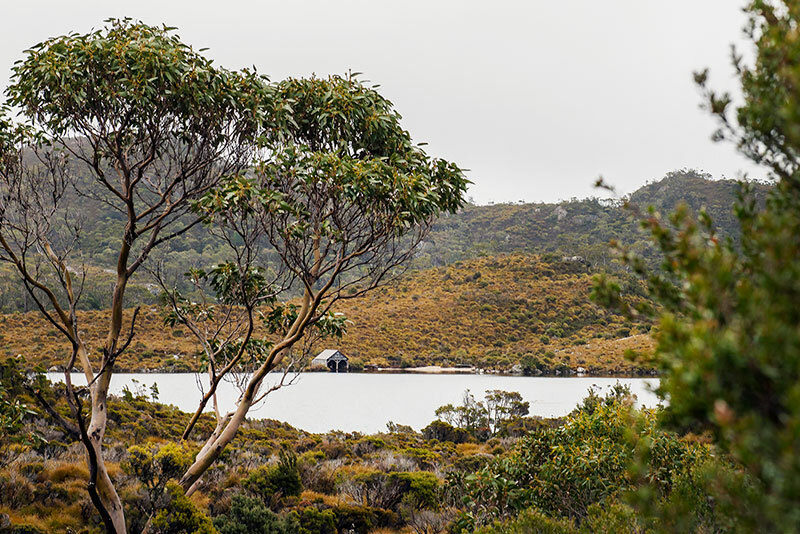 In Tasmania, you’ll find yourself surrounded by wild, rugged vistas, an abundance of wildlife and friendly down-to-earth locals so I hope my Top 5 helps but you really can’t go wrong wherever you choose to explore in Tassie. 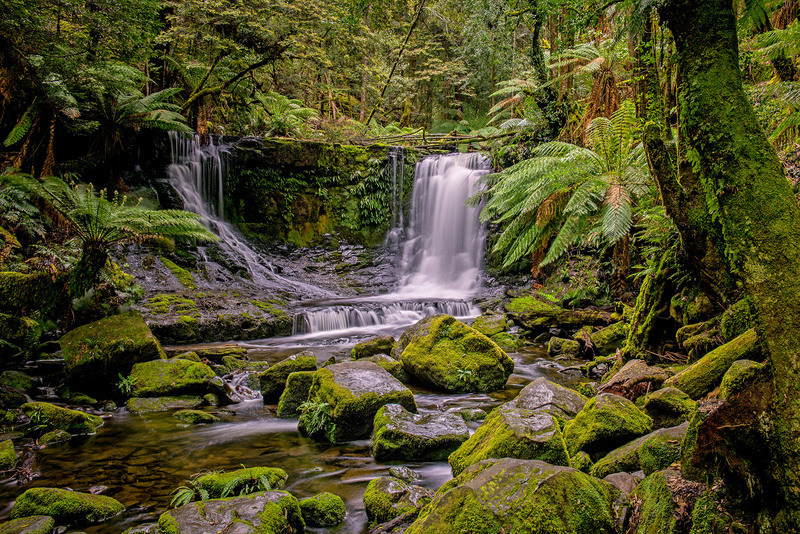 If you would like to hang a little piece of Tassie on your walls, head on over to the gallery to check out my prints for sale or click on the Shop Now button at the top of the screen. Ps. This is not a sponsored post. When I’ve mentioned companies, hotels, restaurants or anyone else it’s because I would highly recommend them and they truly added to our experience. I have not received payments, discounts, free stuff or kickbacks from any of them.